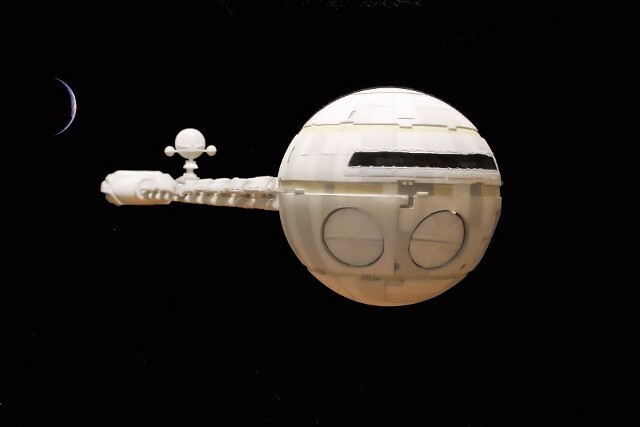 At last, I finally found a model I had wanted to build since seeing the movie in 1968. 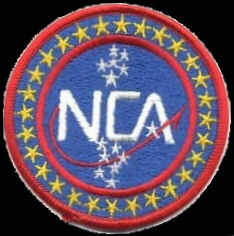 Starship Modeler was a tremendous asset in this endeavor. Not only was it the means to acquire a copy of this kit, but the build reviews of Karl Dodenhoff and Brian Thewlis proved to be quite valuable in determining my own strategy in building and detailing the model. Like both Brian and Karl. 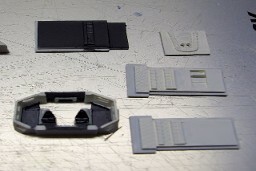 I was going to build a full interior – both the flight deck and the Pod Bay. 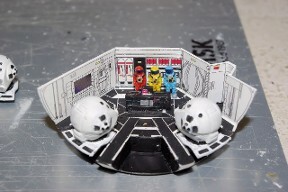 However, that’s where the similarities in the final build stops, as I did not wish to extend the Pod Platform outside the hull, so the Pod Bay Door could be placed back into the “closed position,” allowing both levels of display, and I also wanted to do a the flight deck lighting more in concert with the look of the movie flight deck set. The lower forward section of the flight deck, which mounts into the upper hull hemisphere was painted flat white, as a background for the decals. 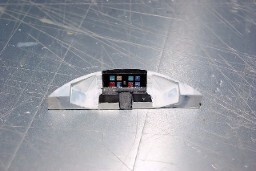 The same material was used for the two small windows of the rear ante-room door. The rear door plastic was painted in clear yellow to set the proper lighting color. The ante-room was assembled first. The floor, the side walls and the rear door panel were bound by rubber bands and glued. Once dry, the bands were removed. You can see how the translucent ceiling panel now looks. Next, it was time to look at the forward section of the flight deck. In the film, you can see translucent panels ringing the outer surface of the flight deck, between the rear walls and the forward panel. The detail for these panels does exist on the part, but needed to be cleared of material by means of the Dremel. Once completed, the forward section was fitted to the Ante-Room to create a single-unit assembly which would be fitted to the upper hull later. 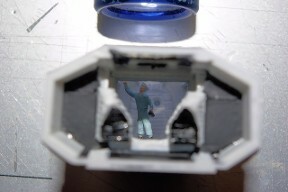 I used a “jump-suited” technician figure from another 1/144 scale model to replicate one of the Discovery crew checking the controls on the Ante-Room wall. After painting the figure for the appropriate blue suit color and facial and hair detail, he was secure to the Ante-Room floor. 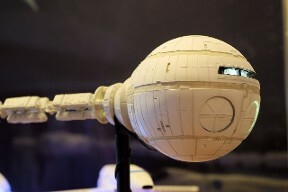 The “well” around the forward windows was hand-painted flat black, to match the look of the movie model. 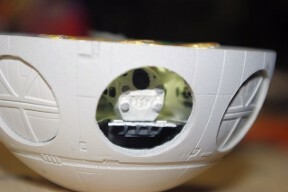 The lower console section was also done in flat black – primer white as the upper hull was prior to placement of the decals. 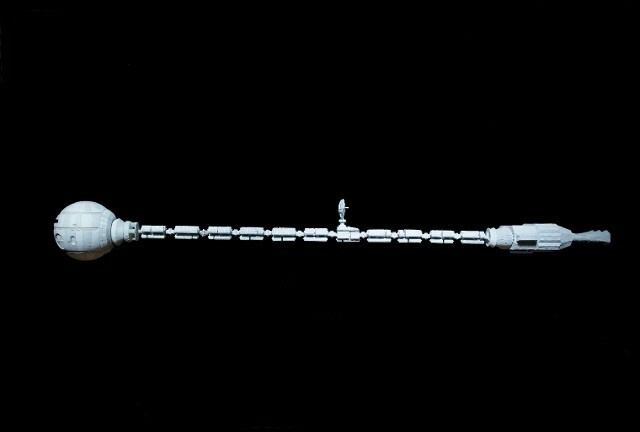 I decided to work on the Pod Bay at this time, as the finished height of the Pod Bay would have an impact on the lighting system. 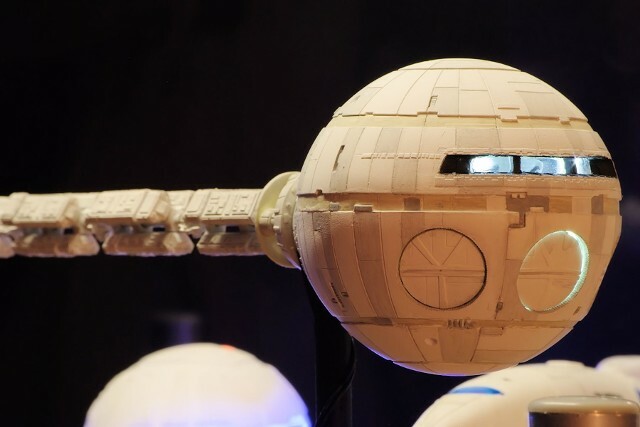 The Pod bay was fabricated directly along the lines provided in the Stargazer manual, with one exception, I think. In my build, the ceiling of the Pod Bay was set onto the interior top edge of the Pod Bay walls instead of on top of them, so that there was no extra height above the walls. 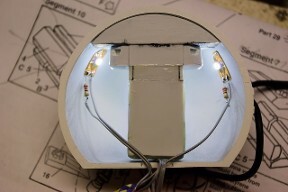 This would allow the placement of the ribbon LEDs to the ceiling after placement into the hull, without interfering with the flight deck assembly above. This rrequireduired that the “ledge” around the perimeter of the ceiling, as well as the dimensions of the in-set on the right side, needed to be filed down. The wall and floor decals were far more problematic than I would have expected. Because they are so thin, it would have been better to place them prior to assembling the wall onto the bay floor, but we managed to get them in place anyway. After decal placement and drying, the interior was over-coated in Dullcoat to seal the surfaces. Early on, I decided not to try to extend a pod platform outside the open Pod Bay Door, so that a way to reattach the door could be made. This way the model could be displayed open or closed. 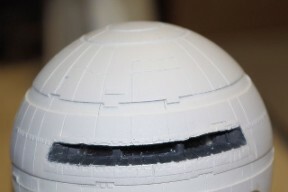 So, to facilitate the “open” phase of the look, the center Pod was fixed to its platform facing outward. The two other Pods faced inward, in their “stowed” positions. Then the Pod Bay ceiling with its translucent panel was installed onto the inside edges of the walls. The three positive and negative lines were combined and insulated from each other to create a common connection point. For wiring clearance past the floor disk, a simple trough was sanded out with the Dremel sanding drum. Then the Flight Deck assembly was secured to the forward console area as intended, making sure that the bottom edge of the Flight Deck was as close to the bottom edge of the forward section opening as possible, to allow clearance for the Pod Bay lights. 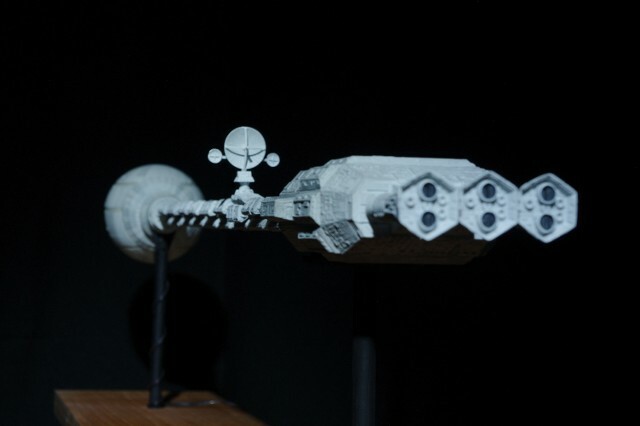 They were then located along side of the Flight Deck on the hull’s inner surface as shown. Again, all positive and negative leads were combined for common connection. 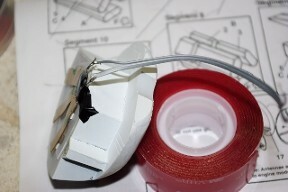 Once set, the upper and lower halves were brought together, back edge to back edge, and the final electrical connections to the lead wire was made, soldered and insulated. 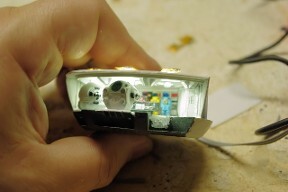 Once the CM glue had cured, it was time to do a “light check.” I connected the lead wire to the power supply and turned off the workbench light. It was very easy to see where the seam between the upper and lower halves still did not close completely. 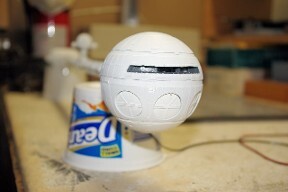 Even after sanding and testing of the halves prior to paint. The thin gab was filled with super-glue, allowed to cure completely, and then painted over them with flat black first, then with flat Grey and then flat white to close the “wound.” Seam closed. The Reactor Unit was built up in direct accord with the Stargazer instructions, except the hole for mounting the Spine rod was done to each section of the assembly first. Using a small drill press, the holes were drilled for the three Engine Bell Units first, then the central hole for the spine rod on the other end, using shims to maintain “flatness” of the Reactor Unit on the drill press floor. Then, Parts 22, 23 and 26 were all drilled out for the spine rod as well. The rod itself was a “composite” of a 36 inch long, 1/8” brass tube with a slightly smaller steel rod slid into it for reinforcement. 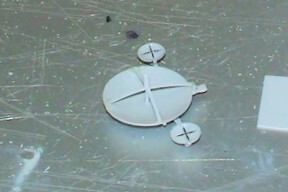 Super glue was run into the joint between the two parts to lock them together. 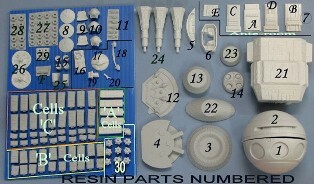 The instructions for the assembly of the Spine and its constituent segments provided full guidance on the make-up of each of the eleven segments, in terms of which parts are used and their orientation. 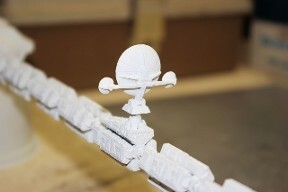 The Stargazer manual alludes to fabrication of these components on the spine rod itself. In the review of the kit by Brian Thewlis, the idea of using a “jig” to fabricate the segments off of the model caught my attention. The “final” length of eh spine rod was determined by using a copy of the dimensional pattern from the manual, plotting off the distance for the eleven segments and adding the requied 2 inches of insertion length to support the CM/SAU assembly. The rod was then cut to length and the end de-burred and cleaned. The result of the jig was like working with an engine stand, as you could rotate the assembly to locate each new component in turn. These segment assemblies require patience, as they must be solidly glued together in order to work with them, and even super-glue takes time to fully cure. 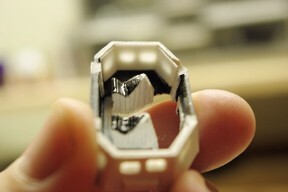 Once completely dried, each segment was inspected for gaps between the central support pieces and the components. If gaps were found, they were closed with additional glue and allowed to cure. The central vanes for the two smaller dishes were yet another matter, I could not get cut plastic pieces to look the way I wanted them to, so I went to a local hobby store and after some discussions with staff to tell them what kind of “cross-shaped” article I was searching for, I came across a set of photo-etched metal parts for a ship model, which had small cross-shapes on it, They were the right size to fit inside the diameter of the small dishes! So, there they are. 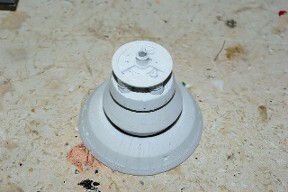 After assembly of the vanes, the Antenna Complex was placed on top of its center segment. The central Pod Bay Door issue had still not been resolved. The trick was to provided a stable enough means to keep the door in position for the “closed: mode, and still be able to remove it fairly easily for the “open” mode. 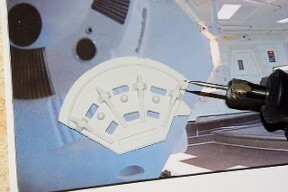 The solution came in the way of placing a section of self-adhesive, soft gel “foot” onto the inner surface of the door, so that he distance from the Pod Platform to the edge would be set on insertion. A very small ribbon of plastic stock was added, so that it bent over the top edge of the door and extended 1.5 mm away from the door. 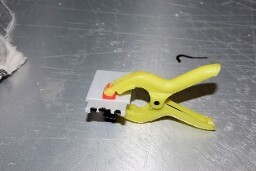 The result is both a “shim” to create the friction necessary to hold the door in place, and a “tab” to pull the door free to change to “open” display mode. As the tab is white and projects no more than a millimeter away from the edge, it is not easily seen, so as not to detract from the look of the model in “closed” mode. 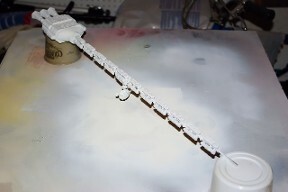 The surface details of the Spine segments and the Reactor Unit were brought out by using a wash of flat black acrylic enamel in acrylic thinner, at about a 40:1 ratio, or about four “brush-loads” of flat black into a 0.5 oz. bottle of thinner. 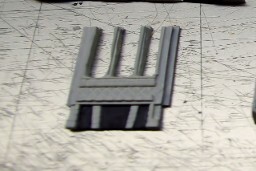 The same wash was used with a very thin brush to accent the seams of the CM and SAU components. Then came detailing and panel painting. 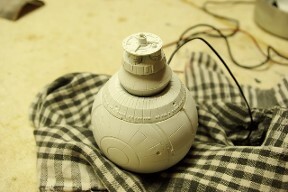 Extensive use of movie still and comparisons to other builds were used for reference here. 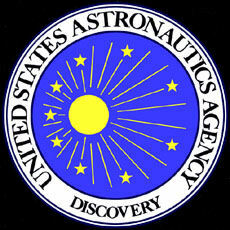 As I said, I have been looking a long time to have a properly detailed model of the Discovery. To see it completed, and sitting on the shelf is both satisfying and surrealistic all at the same time. 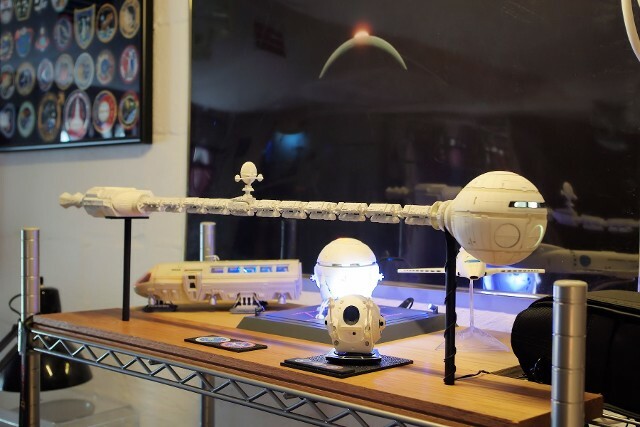 Thanks go to Stargazer for producing the kit and Starship Modeler for providing access to it!! 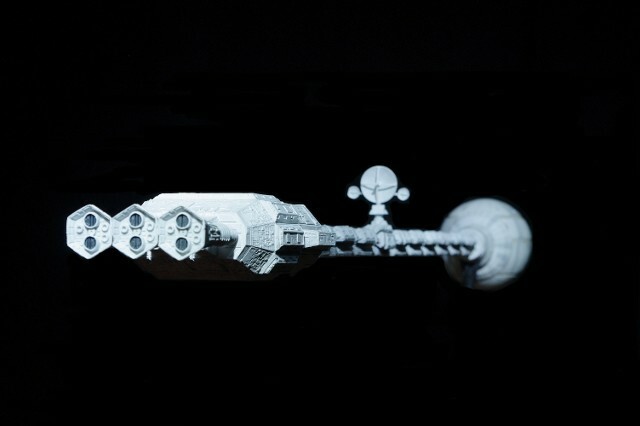 The build of the flight deck was as the Stargazer manual described, except that we wanted to do the “ante-room” lighting through a translucent panel, as seen in the film, as well as light the perimeter of the flight deck through the translucent panels also seen in the film. This required removing the plastic from the ceiling panel between the long horizontal braces, and to open up the panels along the sides of the flight deck, using a Dremel and rat-tail file for finish work. . The two windows on the rear door of the ante-room were also opened up so that light could come through. Using movie stills for reference, we found that the ante-room and flight deck carpet is black, so flat black was use on the floor sections. The walls were flat white, as a background for the instrument decals. The section of the roof panel which mates to the flight deck was also painted flat black, as this section merges with the black instrument panel decal on the upper surface of the flight deck. 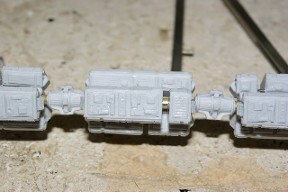 We also painted the rear walls to the flight deck flat black, rather than using the decals provided. 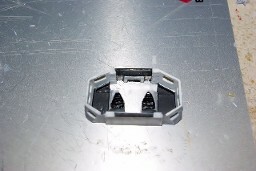 The two flight deck seat supports are gloss white and the seat padding is gloss black. All of the “padded ribs” on the flight deck roof are gloss white as well. A section of 0.20” thick white plastic sheet stock was cut to size for the opening of the ante-room roof, and glued into place. This is translucent media for the overhead lighting. 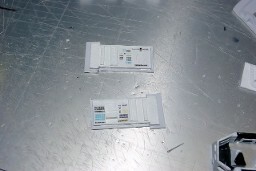 Then the decals were added to the side walls of the ante-room and forward control panel, so they could be “set” and dry fully before full assembly. 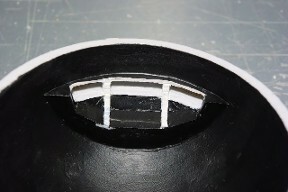 After finishing the openings with a rat-tail file, section of 0.010” white plastic were placed over the interior surfaces. This created the smooth interior wall finish, but allows the light from the openings to come through. 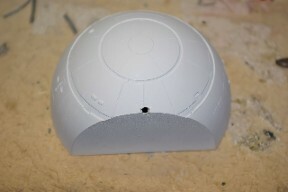 At the beginning of the build, the exterior of the Command Module hull sections were painted in Primer White. The interiors were done in Flat Black first, to act as a light block, and then in Primer White to set the interior main color. 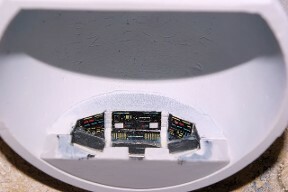 The control console decals were then added to the interior surfaces of the upper hull as specified. 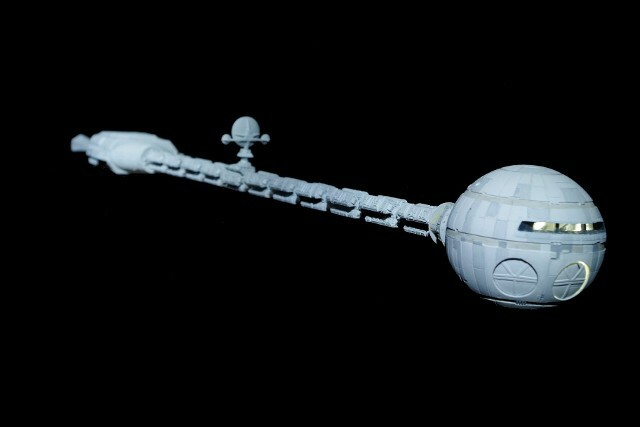 Once the decals had set, additional interior painting was done to bring the area in concert with the movie stills. 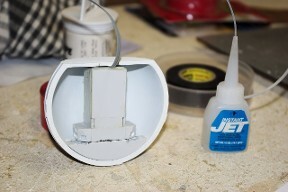 I used 0.010” white plastic as the translucent media for the Pod Bay ceiling. The openings in the ceiling had to be opened with the Dremel tool, then the part was painted alternately in Flat Black and Primer White. 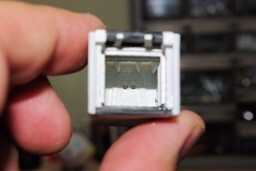 Once dry, the 0.010” white plastic was installed over the openings to become the translucent panels. The bay walls were traced from the wall decal onto 0.020 white sheet plastic, cut out and cut down into segments and set into position on the Pod Bay floor disk and allowed to completely cure. 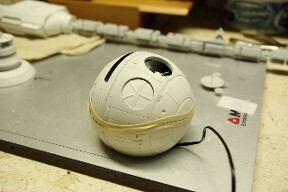 Then, the entire bay interior was painted Primer White. After drying, the decals were positioned. The backside of the walls were then painted Flat Black for light-proofing through the plastic, then painted white to promote internal reflection. The three space suits were painted as seen in the movie and secured to the Pod Bay floor immediately behind the HAL 9000 console, in their “stowed” locations. 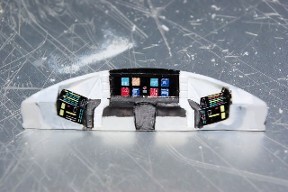 Based on a visual examination of overall fit, it appeared that a 2-3 mm gap between the finished upper surface of the Pod Bay and the top edge of the lower hull would allow for the LED ribbon without touching the bottom of the Flight deck Assembly above. This is why the Pod Bay Ceiling was placed inside the walls. The rest would be controlled from above. With the Pod bay assembly complete, it was time to address the bay lighting. 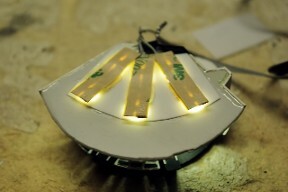 I had already decided to use segments of the ParaGrafix E-Z-LED system to do the job. Then, each two-LED segment was held in position on top of the pod ceiling by small sections of 3M clear VHB double-sided gel tape. 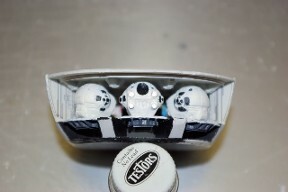 This photo was taken when the right-side Pod came loose due to handling. It was subsequently returned to proper position. 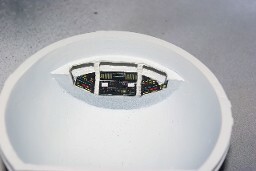 A number of different locations were tried for lighting the Flight deck assembly, but the best results were going to come from a full E-Z-LED segment placed onto the inner surface of eh CM Upper Hull above the Ante-Room ceiling, and LEDs placed on the inner surface near the sides of the flight deck, to illuminate the wall panels. The full strip was positioned as shown. 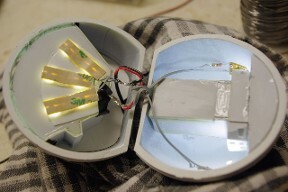 The side lamps were fabricated from the “removed” individual LEDs from two of the Pod Bay segments. 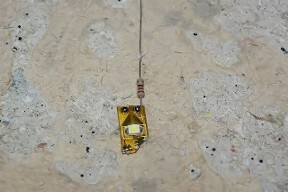 Each was equipped with its own 220 Ohm current-dropping resistor. 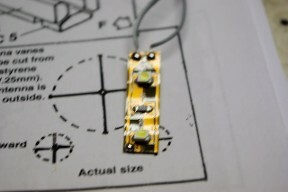 The trace again needs to be shorted to complete the circuit. A thin, flexible two-conductor lead wire was passed through the opening in the lower hull and brought up beyond the top of the hull. The Pad Bay assembly was then placed into the lower hull, checked for alignment and glued into place. 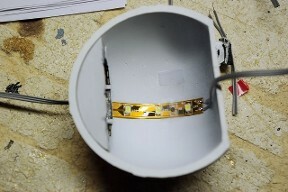 After a check of all LEDs and a test fit, the haves were aligned and glued together. I decided that using a cut section of the spine rod to create two assembly jigs for spine segment work. 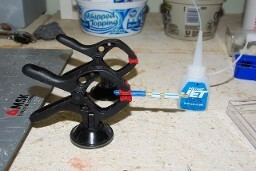 The cut section was halved, and each half was wrapped with blue “painter’s tape” to provide a “stop” for the assembly and was then supported by a spring clamp. The internal segment support pieces (Parts 27 & 28) were then slipped onto the rod, with sections of plastic drinking straw cut to proper length placed between the parts as spacers. As one end of each of the cut-sections of spine rod had a slight “burr” on it, it could be used as a hone to clear out the centers of each segment and each segment “coupler” part (Part 30), so that they could be slid easily down the spine rod into final position. 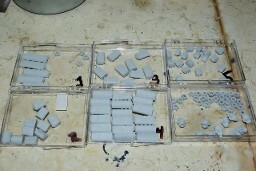 This approach allowed the placement, spacing and alignment of all segments prior to locking them into position with super-glue. The construction of the Antenna Complex was tackled next. The Main Antenna’s central vanes were cut by hand from 0.010” white plastic stock, bent to create a shallow curve and located onto the dish. 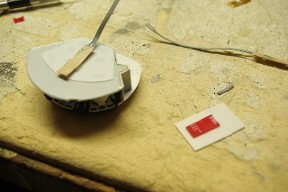 Two small sections of plastic rod were added afterward – one inside between the vanes and the dish surface, and one outside to create the antenna horn extension. 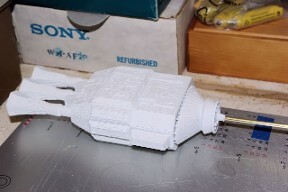 Once completed, the entire RU-Spine assembly was supported and painted in Primer White, to match the rest of the model.